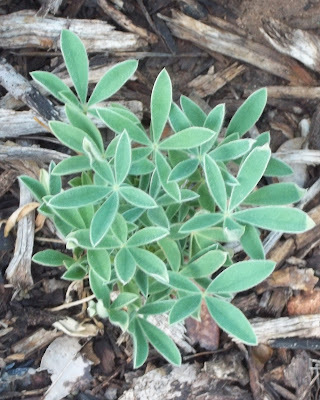 The obvious choice for the letter "L" in my series on the ABCs of Plants in My Garden is our Texas state flower Lupinus texensis or Texas Bluebonnet. This past spring I wrote several times about this beautiful native wildflower so I won't repeat, but I'll add a few photos while linking back to previous posts. The mild winter and rainy spring produced the best crop of bluebonnets in years. So beautiful were these displays I devoted an entire post to bluebonnets for Garden Blogger's Bloom Day in March 2012 and another for Wordless Wednesday. A follow-up post detailed collecting and preparing bluebonnet seeds for planting. The seeds we didn't pick up have already produced seedling rosettes in the garden. This post has been a good opportunity to consolidate information on Texas bluebonnets and enjoy the memories of a beautiful spring 2012 during the current mid-summer heat. I have also added a tab at the top of my blog with the list of featured plants in my ABCs of Plants in My Garden series. The front garden was looking quite nice after all the improvements over the past few years. But I felt improvements could still be made. How would I improve this? By adding a focal point to the space in front of the garage. The tree-form vitex (left) and Texas Mountain Laurel (right) were not quite enough of a focal point. The vitex blooms once briefly in early spring then goes dormant through the winter months and the evergreen Texas Mountain Laurel doesn't quite fill the gap. The Agave ovatifolia also needed a silvery friend to connect silver foliage from across the yard. That's where this Bismarck Palm comes in. Palm trees need a wide planting hole, look at all those rocks that had to be dug out. Palms are very drought tolerant so check the planting level to make sure it isn't too deep. We filled in around with a sandy loam top soil mix, watered it in slowly, and mulched to keep the roots cool. Our current brief respite of a few partly cloudy days and somewhat cooler summer will help too. It holds the light like a catcher's mitt and connects the silvery foliage from around the yard, including the sages on both sides, and numerous smaller plants like gray santolina. Cold tolerant in our zone, it should do well with just a bit of protection in the first few years. There's the focal point, it has plenty of room to spread out and should grow above the roof line within a few years. Palms don't provide a lot of shade so the perennials in the bed below will continue to get sun here too. The spot in front of the garage now feels like it has a focal point and the silvery plants are better connected. Besides all that, I've always thought a palm tree would look nice there. It's often a surprise to see how things turn out in the garden--sometimes better than I envisioned and sometimes not. The latter is the case with the sunflowers intended to dress up the fence this year. They didn't quite turn into a cheerful row and only this one managed to fully bloom, although showing signs of a struggle. The next letter in my series called The ABCs of Plants in My Garden is K. K is for Kalanchoe, which is a succulent native to southern Africa. While researching these, I was surprised to find I had a total of six different varieties of kalanchoe as opposed to the two I already was aware of. They are so easy to grow and propagate that other gardeners share them generously. They are monocarpic, blooming just once and then producing offsets. As with most succulents around here I keep these on the deck and away from the hungry herd of deer that regularly browse my yard. Let's meet them one by one. The names on this list are based on labels or my own research so feel free to point out corrections as needed. K. blossfeldiana: The kalanchoe most familiar to me, and I call this one "supermarket" kalanchoe since that's where we often see them for sale. This yellow bloomer fits nicely in the top of a strawberry pot. 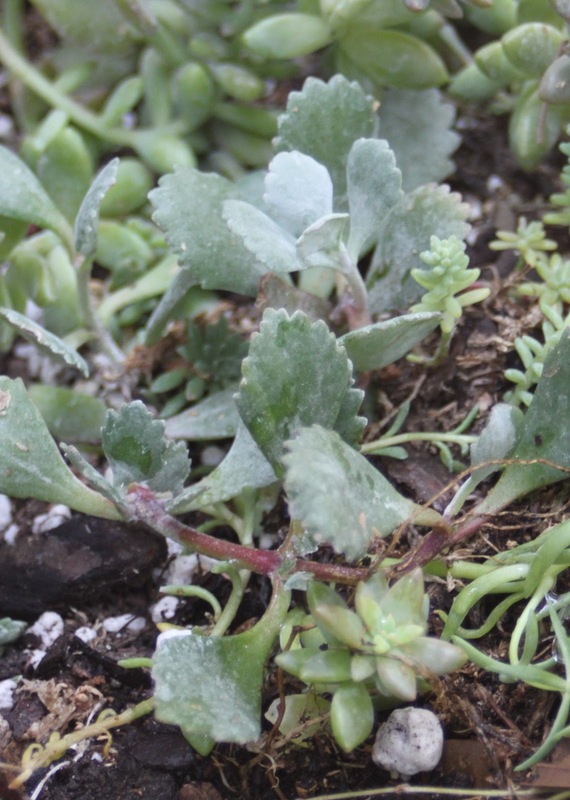 K. diagremontiana: Mother of Thousands or Alligator Plant, a commonly shared plant in among gardeners in this area. The long pointed leaves with the little plants growing along the edge does look a bit like an alligator and the only one we'll see this far inland except at the zoo. I like the structure and this one will survive a mild winter in the warmer parts of town where it can also be somewhat invasive. K. gastonis-bonnieri: Donkey Ears, the mottled pattern and soft texture of these leaves makes it a favorite. Look closely to see new plants forming at the end of the very long leaves. The leaf in front is 18"/7cm. Long floppy ears work well in this wire basket. K. laetivirens: Called 'Big Momma' and it is similar in structure to the K. diagremontiana with larger, greener leaves. It also produces new plants along the edges of the leaves. Most of these can be propagated by pushing a broken piece of leaf in soil, such as this one in the pocket of a strawberry jar. The new plant popped up within a couple weeks. K. luciae: Paddle shaped kalanchoe, This is a pretty little plant is in the new succulent window boxes I'm trying out this year. K. pumila 'Frosty Pink': This is a tiny one that can fill in the window boxes like a ground cover. Kalanchoe are all frost-tender and will need to come indoors during the winter. I'm getting so many plants needing winter protection now it's a good thing we are adding a screen room to the deck which I will convert to a winter greenhouse for our few months of cold weather we have each year. An invitation in the form of a newsletter from The Antique Rose Emporium was upbeat and offered one last chance to walk through their San Antonio gardens and share a refreshment before they closed down this location. I was still a bit unsure if I wanted to return. My last visit had been just before the closing of the gardens was announced. Going back now meant knowing it was my last visit. How did I want to remember these gardens? When Sunday arrived, I decided not to miss this opportunity and It turned out to be a good decision. Mike Shoup, founder, owner and legendary rose rustler of The Antique Rose Emporium, was there to greet us and offer homemade tamales and sweets. Even though I have attended his seminars over the years, I'd never had the chance to speak with Mike directly. There I am in the blue shirt and hat with the surprised look. We're not talking plant business. It turns out we grew up in the same area of Houston and attended nearby rival high schools at the same time. Mike and Robbie, the manager of this location, walking in the courtyard. I will always marvel at his vision in creating this beautiful garden. One more look at the stunning yucca in the blue adobe courtyard. A view of the many native plants between the adobe courtyards and Hacienda. I don't think I've shown this view before. The resident cats are now in adoptive homes and report that their new people have adjusted well. A long view of the sales area with the bottle tree and gift shop in the background. The A. ovatifolia bloom I wrote about this spring was dropping dried petals but had not yet formed bulbils. The lower leaves are beginning to die out. After a tour of the gardens, I decided to pick up the plants I kept planning on adding "next time". Now or never I decided and finally bought that native Texas Sotol (Sotol Texanum) I'd been looking at. A dwarf pomegranate, dicliptera/wooly justicia, red rocket russelia, clerodendrum ugandense, weeping muhly, and salvia argentea are also added to my cart there in front of the check out. Clyda, a member of the staff working the register, was glad we stopped by one more time. She thought the Agave americana bloom by the adobe courtyard might just fall over from sadness on Sunday. It is very tilted but was still there when we left. The remaining inventory will be moved to the Brenham nursery, which will remain open, and this property will be sold. Mike put it simply, "it's time". Thank you Mike for sharing this beautiful and inspiring place with us. We'll visit you in Brenham. Using succulents is a great way to grow plants where others struggle. These problem solving plants are the focus for today's Foliage Follow Up sponsored by Pam Penick at Digging. These cradle style planters worked out well at the breakfast room windows because the feet sit securely in the window frames and drilling into the stone for standard window boxes was out of the question. The last two years I tried annuals here but there's not enough room for soil to keep annuals watered. It's no problem for succulents with their small root system and limited water needs. We enjoy seeing these green plants from inside and most of these will eventually bloom as well. Strawberry jars with their interesting little planting pockets are a favorite of mine. The problem is it's especially difficult in our hot, dry climate to keep many types of plants growing in them. That may be why I find so many at garage sales around here. I picked up these two in April for just $2 each. This year when I planted strawberry jars, I took inspiration from my friend Ragna and went with succulents all around. Succulents work so much better than annuals and I don't have to worry about the plants drying out. I like mixing varieties of plants, mostly from plant swaps. I enjoy making my own pots from concrete and hypertufa mixes. Concrete will dry out plants and soil quickly, so succulents are the answer here too. Three planting problems solved with succulents and I'm still looking for opportunities around here. Head on over to Digging to see how other garden bloggers celebrate the importance of foliage in their gardens in July 2012. The San Antonio River Walk is one of my favorite places in San Antonio. Not the famous part with all the bars and restaurants, but this River Walk which extends north and south into our neighborhoods. Most tourists see a very small part of the River Walk, but it has been more than doubled in recent years and runs about 15 miles long now. 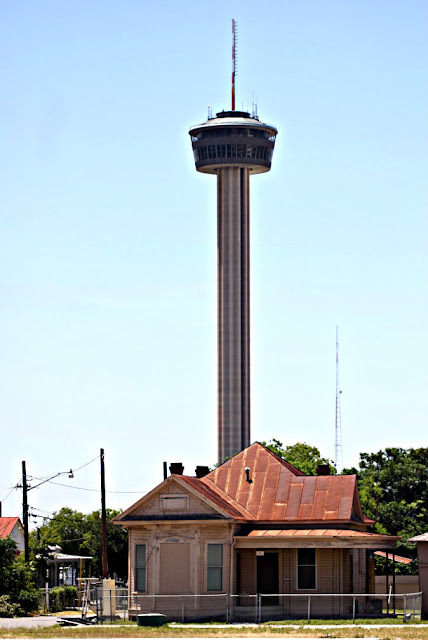 These far reaches of the river are enjoyed mainly by San Antonio residents. Office workers enjoying a break or headed to a meeting. Dog walkers and bicyclists from nearby residences. I walk here to check out the landscaping ideas and to enjoy my city without battling the crowds for parking. Last fall I shared photos of the Museum Reach of the San Antonio River Walk. At that time I ended at the Newell Avenue bridge near the San Antonio Museum of Art. Cross another big project off the list -- the driveway landscaping is done! In my post on the new wheel garden in my back yard I showed a glimpse of the shed. Pam Penick from the blog Digging left a comment asking to know more about the shed. I was planning to post photos at some point so here by special request is the story of our Texas style shed along with some how-to tips. Considered common in this region of Texas, it's not at all common looking. Even more striking against the blue adobe courtyard at The Antique Rose Emporium here in San Antonio. A bit of red, white, and blue just in time for the Fourth of July.